Growing Bin burst into 2018 with a bang, crash and symbol splash, uniting a premier pair of percussion obsessives for a supernatural mission into the heart of the rhythm. Dressed in the pitch black of Dusseldorf stands Wolf Mueller, master of the tropical drums and seven time Salon Des Amateur breakdance champion. Repping Cologne and Berlin is Niklas Wandt, Germany’s funkiest drummer and a mixed musical artist as adept in experimental jazz as demented Eurodance. 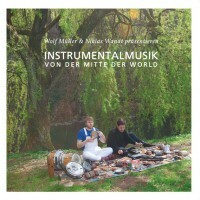 Standing toe to toe in a no holds barred, no drum unstruck groove contest, these two titans will make you swing your pants like a Crash Bandicoot victory dance... so stretch out and step into "Instrumentalmusik von der Mitte der World". Taking to their task with the joyful abandon of two big kids getting creative with the Kindergarten music tray, Müller & Wandt marry dripping electronics, Froesean pads and rubber-limbed basslines with tribal polyrhythms, C2 claps and Indonesian shakers - and that‘s only on the A1. Comprising of three trance-inducing epics, a handful of medium-sized movers and a couple of freeform interludes, this dynamic double pack could almost pass as a lost Library masterpiece; but our mind guides go Furthur, fusing esoteric funk and free-jazz freak-out a truly transportive experience. Prepare to enter a world of techno totems and neon skulls, shades of Yello and excellent birds. Within these grooves lies a transdimensional pathway between the Temple of Doom, the Twilight Zone and De Palma‘s Paradise, brought to life in a shamanic rite. Forget the healing frequencies of Growing Bin‘s ambient outings, this time we‘re dancing for mental health. 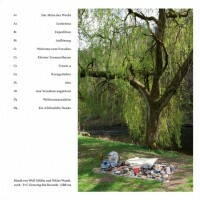 Patrick says: Growing Bin continue to smash it with this MASSIVE double LP from Dusseldorf disco king Wolf Muller and percussion freak Niklas Wandt. Packed with all manner of tropical drums, kosmische tones and infectious grooves, this is retro-futurist dancefloor exotica like you've never heard it before.